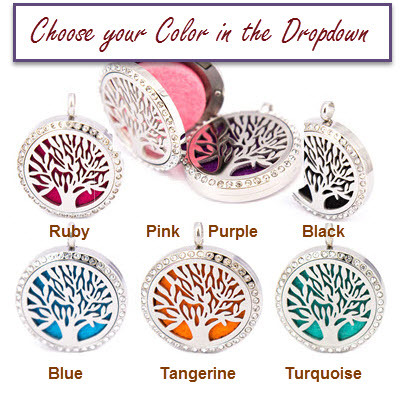 1 - Tree of Life Stainless Steel Aroma Pendant! This unique pendant, adorned with a circle of tiny rhinestones, contains a colored felt disc which can be scented with your favorite biblical aroma to carry with you all day! Comes with one felt disc, but additional colored discs can be purchased from our web site to allow for a new color and a new fragrance of your choosing. Choose color of felt disc inside necklace by clicking on the OPTION down arrow located right above the retail price.